H. Goldschmidt discovered asteroid #40 Harmonia (daughter of Mars). J. Palisa discovered asteroids #254 Augusta and #255 Oppavia. A. Borrelly discovered asteroid #308 Polyxo. J. Coggia discovered asteroid #444 Gyptis. M. Wolf discovered asteroids #821 Fanny, #822 Lalage, #823 Sisigambis and #1661 Granule. La Plata Astronomical Observatory discovered asteroid #3179 Beruti. USSR launched Luna 10, the first human-made spacecraft to orbit the Moon. 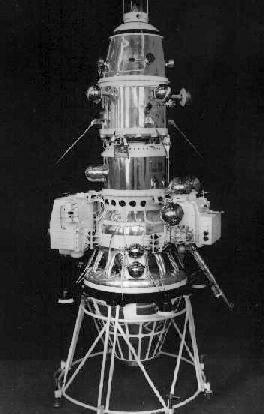 Luna 10 was launched towards the Moon on 31 March 1966. The spacecraft entered Lunar orbit on 3 April 1966 and completed its first orbit 3 hours later (on 4 April, Moscow time). Scientific instruments included a gamma-ray spectrometer for energies between 0.3-3.0 MeV, a triaxial magnetometer, a meteorite detector, instruments for solar-plasma studies, and devices for measuring infrared emissions from the Moon and radiation conditions of the Lunar environment. Gravitational studies were also conducted. The spacecraft played back to Earth the "International" during the Twenty-third Congress of the Communist Party of the Soviet Union. Luna 10 was battery powered and operated for 460 Lunar orbits and 219 active data transmissions before radio signals were discontinued on 30 May 1966. Explorer 1, the first US satellite, reentered Earth's atmosphere after 12 years in orbit. Explorer 1 was the first successfully launched US satellite. Launched 1 February 1958 on an adapted Jupiter-C rocket, Explorer 1 carried instrumentation for the study of cosmic rays, micrometeorites, and for monitoring of the satellite's temperature. Explorer 1 re-entered the Earth's atmosphere on 31 March 1970, after more than twelve years in orbit. USSR launched Cosmos 1000 from the Plesetsk cosmodrome, part of a six-satellite Soviet military navigation system. E. Bowell discovered asteroid #3078 Horrocks. NASA's STS 76 (Atlantis 16, 76th Shuttle mission) landed after completing the third Shuttle-Mir docking, and carrying the SPACEHAB module. Pioneer 10 officially ended its science mission, routine tracking and project data processing operatations were terminated for budget reasons. Pioneer 10 was launched 3 March 1972. This mission was the first to be sent to the outer solar system and the first to investigate the planet Jupiter, after which it followed an escape trajectory from the solar system. The spacecraft achieved its closest approach to Jupiter on 3 December 1973, when it flew over the cloud tops at a distance of approximately 2.8 Jovian radii (about 200,000 km - 130,000 miles). After more than a decade in space, Pioneer 10 crossed the orbit of Neptune on 13 June 1983 and became the first human-built space vehicle to leave the Solar system. As of 1 January 1997 Pioneer 10 was at about 67 AU from the Sun near the ecliptic plane and heading outward from the Sun at 2.6 AU/year and downstream through the heliomagnetosphere towards the tail region and interstellar space. This solar system escape direction is unique because the Voyager 1 and 2 spacecraft (and the Pioneer 11 spacecraft) are heading in the opposite direction towards the nose of the heliosphere in the upstream direction relative to the inflowing interstellar gas. Pioneer 10 is heading generally towards the red star Aldebaran, which forms the eye of Taurus (The Bull). The journey over a distance of 68 light years to Aldebaran will require about two million years to complete. Routine tracking and project data processing operatations were terminated on 31 March 1997 for budget reasons. Occasional tracking continued later under support of the Lunar Prospector project at NASA Ames Research Center with retrieval of energetic particle and radio science data. The last successful data acquisitions through NASA's Deep Space Network (DSN) occurred on 3 March 2002, the thirtieth anniversary of Pioneer 10's launch date, and on 27 April 2002. The spacecraft signal was last detected, from a distance of 82 AU from the Sun, on 23 January 2003 after an uplink was transmitted to turn off the last operational experiment, the Geiger Tube Telescope (GTT), but lock-on to the sub-carrier signal for data downlink was not achieved. No signal at all was detected during a final attempt on 6-7 February 2003. Pioneer Project staff at NASA Ames then concluded that the spacecraft power level had fallen below that needed to power the onboard transmitter, so no further attempts would be made.